Americans love their shrimp. 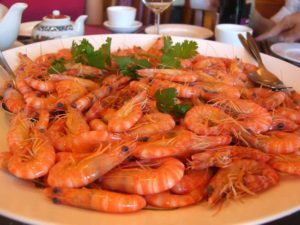 It topped the numbers for all seafood categories, with the average American consuming about four pounds of shrimp annually. That means almost 1.3 billion pounds of shrimp are consumed in the United States every year. Where does all this shrimp come from? Shrimp are naturally found at the bottom of oceans, lakes, and rivers throughout the world. Their favorite spots are coastal areas and estuaries. There are over 2,000 different species of shrimp and they live in every kind of climate—from tropical to polar. Shrimp fisheries regularly harvest shrimp from these locations, using trawl nets, longlines, and purse seines. Unfortunately, when shrimp are being harvested from the ocean, bycatch is a significant problem. Bycatch is a situation where other unwanted fish or sea creatures are caught in a fishing catch. Shrimp fisheries often caught as much as six pounds of bycatch for every pound of shrimp they caught. This included fish, turtles, sharks, seabirds, and anything else that happened to be swimming by the net. Overfishing of wild-caught shrimp is also a problem. With overfishing, shrimp stocks of larger species have declined 70 percent over the last four decades. These issues led to shrimp farming. If you thought all of your shrimp was coming from the deep ocean, you’ll be surprised to know that a lot of it comes from shrimp farms all over the world. Most of the shrimp farms are in Southeast Asia and Latin America, but the shrimp farm industry in America is growing as well. Shrimp farms came on the scene in the 1970s as a result of the high demand for shrimp in the United States, Western Europe, and Japan. Wild-caught shrimp just could not supply the demand any more. China was one of the biggest shrimp exporters…until they started eating more shrimp too. Shrimp farming is an aquaculture business that grows shrimp in either an indoor contained tank, called tank farming, or in a cultivated marine or freshwater body of water. When the shrimp are in a contained area, the water sometimes has problematic conditions, such as parasites, toxic gases, and disease-causing strains of vibrio bacteria. For this reason, shrimp farm water treatment involves the application of probiotic formulas that create healthy environments for fish. There’s much debate about wild-caught shrimp versus farmed shrimp; however, what really matters is the environment in which it was produced. If shrimp grow up in a healthy environment, the shrimp delicacy on your plate is healthy too. Besides, it doesn’t look like our taste for shrimp scampi is going away any time soon. We will need to find alternative ways to grow and harvest shrimp.